A customer in Louisiana orders a new television from a local electronics retailer. The local retailer sends the order to its national warehouse in Washington state. The warehouse selects the television from a Japanese manufacturer’s latest shipment and schedules the package for delivery. Will the television be shipped by air? Would the retail chain’s network of trucks be well-suited to deliver this package? Or would a combination of freight transport east and barge transport down the Mississippi be the most efficient route? Transportation & Logistics is a broad, diverse industry that deals with organizing the distribution of resources. 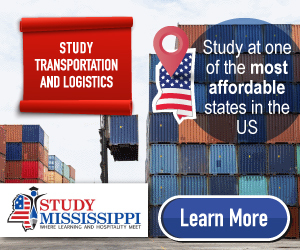 If you are an international student who loves solving puzzles and devising equations to answer problems, you might consider studying transportation and logistics in the US. As home to the world’s largest and most diverse consumer market, the United States has an enormous supply system, and its highly skilled workforce and relatively low costs draw investors from all over the world. In 2011, nearly $1.3 trillion was spent in the US transportation and logistics industry, and the industry brought in 8.5% of the country’s gross domestic product. A good’s most efficient pathway to consumers often involves a combination of these transportation methods. Transportation and logistics professionals analyze data to optimize delivery schedules. Analysts are responsible for evaluating yield data, maintaining route schedules and business costs. It is the analyst’s job to optimize efficiency within the delivery system and communicate his or her findings with other team members. Import/Export coordinators are responsible for overseeing the shipment of goods in and out of country. Coordinators, as well as export/import managers, ensure that shipments pass through customs and make it to the next stage of delivery; as a result, they must remain up-to-date on regulations and procedures. Importer/Exporters also manage the shipment data that analysts use to optimize delivery systems. Account executives are responsible for managing sales and customer service. Account men begin, develop, and maintain relationships with clients. When something goes wrong, it is the responsibility of an account executive to coordinate with the operations side of the delivery so they can explain the problem to the client. Although a college degree is not necessary for this position, experience within the industry is usually required and companies prefer candidates with a college education. A degree in transportation and logistics would provide candidates with such knowledge and experience necessary to give them a leg up in the industry. How many other surgeries are scheduled that day? Which rooms can accommodate such a surgery? What staff needs to be scheduled? Is the hospital stocked with the necessary supplies and when should those supplies be delivered? How soon can the room be used again? Hospitals rely on logistics professionals to evaluate data and streamline their systems so that questions like these aren’t a problem. Hospitals are only one example, however. Any organization large enough to have these questions uses logistics to answer them. As the American economy grows, more companies will need logistics professionals to organize their systems and optimize those systems’ efficiency.